We are the nation’s heart charity and the largest independent funder of cardiovascular research. Coronary heart disease is the UK’s single biggest killer but we are leading the fight against it. Be part of the fight with the flexiteer opportunity at a bucket collection within Sainsbury’s on Broad Street in Reading on Friday 15th and Saturday 16th December between the hours of 9am – 5pm. You can give as little as an hour! Although we would welcome people who can give more. 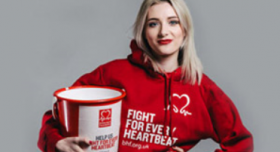 You will be provided with a BHF branded tabard or similar to wear whilst collecting. Friday 15th and Saturday 16th December - 9am-5pm give as little as an hour.